Any fertile soil with good drainage. Fair. Where winters are mild and the soil does not freeze, established plants may survive one winter. Mix a standard application of a balanced organic fertiliser into the soil prior to planting. Dianthus. Scabiosa mixes well with many summer flowers including black-eyed susans and petunias. Sow scabiosa seeds indoors in early spring and set seedlings out two weeks before your last spring frost is expected. Transplant carefully, without disturbing the roots. Scabiosas make great cut flowers, and many varieties are fragrant. Colours include lavender, pink, rose, dark red, white and soft yellow. Perennial forms are available, but not in the colour range of seed-sown annual scabiosa. Harvest stems to use as cut flowers as soon as the blossoms open. Clip off old blossoms every week or so to prolong bloom time. 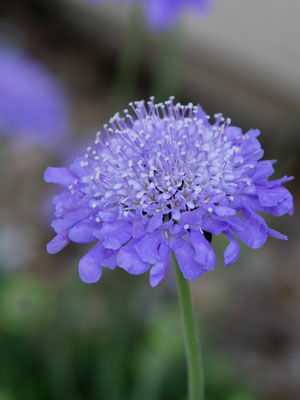 Scabiosa plants may need staking to keep them upright so that the stems do not twist.